Darkglass Electronics introduces at NAMM 2014 its fifth pedal, Vintage Deluxe, a vintage-style overdrive. EC Pedals and Michael Benson collaborated for the creation of FuzzDriver, an effect pedal for bass that combines a fuzz and an overdrive. Ashdown announces the release of the NM2 dual distortion pedal designed in collaboration with Foo Fighters bass player Nate Mendel. Darkglass will launch in December a new stomp box featuring two independent fuzz circuits, named Duality. 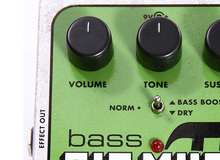 Electro-Harmonix opens its Next Step series to bass players with the Crying Bass wah/fuzz pedal. EBS Sweden is shipping its new FuzzMo distortion and fuzz pedal for guitar and bass. Source Audio adds to its SoundBlox 2 multi-effect series the OFD Bass MicroModeler and OFD Guitar Modeler pedals.